What a great idea for a Top Ten Tuesday meme! From The Broke and the Bookish, top ten books with under 2000 Goodreads reviews. Here’s Chachic’s set. What great choices (well, the ones I’m familiar with, which is about half of them). I might trade out And All the Stars for the Medair duology, though that’s a tough choice for me. Here’s Brandy’s list. Well, obviously I don’t love this set of books quiiiiite as much, since none of my own books are present. Seriously, though, what surprises me is that A Face Like Glass has under 2000 reviews. But I checked just out of curiosity and I see it is not a lot less — about 1700. In contrast, though, Uprooted has about 40,000 ratings last time I checked. So you see. Well, well. It’s a bit tricky. Let me see . . . I’m going to try to do this without repeating any books from Chachic or Brandy; not even any authors if I can manage it . . .
2. Island of Ghosts by Gillian Bradshaw. To my astonishment, it has fewer than 600 ratings. Wow, are Goodreads patrons missing out on some great books! 3. Cuckoo’s Egg by CJ Cherryh. I figured. Anything published as far back as 1985 probably has an uphill struggle on Goodreads, even by a famous author like CJC. 6. The Lens of the World. Shameful to see how few ratings and reviews it has. Not that I’ve reviewed it, either. It’s the older-book thing again. 7. 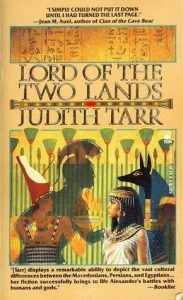 Lord of the Two Lands by Judith Tarr. One of my very favorite historical fantasies. 8. A Stranger to Command by Sherwood Smith. It’s not quite as low on ratings as some of these others, but it’s way below Crown Duel / Court Duel and that’s too bad. two more, two more, how hard can this be? FINE, let me try thinking of recent releases . . .
9. Silver on the Road by Laura Anne Gilman. It’s getting up toward a thousand ratings now, but it’s not there yet. One more, one more . . .
10. Oh, of course. Serendipity’s Tide, first book of an indie-published trilogy that has had no publicity (as far as I know) and certainly remains thoroughly under the radar. I liked this trilogy a lot. There you go, and that certainly reminds me to make sure I’ve posted reviews of all these myself. This is very fun! You are tempting me away from my usual YA and middle grade fare – the Judith Tarr looks especially intriguing. Katy, honestly, I think a whole lot of these will “feel” YA enough for you — and *surely* you will love Island of Ghosts! If you try any of these, I’d love to know what you think. Thanks for linking to my post! :D From your list, I’ve only read A Stranger to Command and I agree that it deserves to have more readers. Same goes for the rest of Sherwood Smith’s books. Her Sasharia en Garde duology also have low ratings and those were so much fun to read. I think I have Silver on the Road and Serendipity’s Tide on my TBR pile. I still have so many of Sherwood Smith’s books on my TBR pile! Including that duology, I’m almost sure. I just did a sort of my book list on Goodreads to see what my 5-stars with low # of ratings were. Kinda funny to see! David Zindell’s Neverness books (I love these scifi-ish books so much). I can’t believe Wells’s Death of the Necromancer doesn’t have 1600 ratings yet. So fun. Wurts’s To Ride Hell’s Chasm only has 967 ratings? What the hell. Glen Cook’s The Dragon Never Sleeps was a great scifi novel–dense, though! (I heard he intended for it to be a trilogy but couldn’t get the contract, so just condensed it all in one book–which I think just made the book more awesome). Well, you just expanded my TBR pile, David. Haha, happy to help! I hope at least one of them work out for you.